You don't deserve to be a moderator in the balisong section. flatblackcapo, skyblue, HedaCoon and 3 others like this. Uncle Cheech and AnthonyTheAbyss like this. AnthonyTheAbyss, Balibuyer, seandavid55 and 1 other person like this. Syfer22 and seandavid55 like this. flatblackcapo, begreen61, Thanos74 and 4 others like this. subtlemovement and seandavid55 like this. The out of towners this week. begreen61, Thanos74, AnthonyTheAbyss and 3 others like this. I had to add one to my collection..
flatblackcapo, thegoodedge, skyblue and 4 others like this. Who what when where.... Tell me about it. Looks amazing. Shes a beaut…..Lovin that handle design and that blade looks mighty Les Voorhies-ish to me. Thanos74, Balibuyer and BennytheBlade like this. There was a Marlowe auction recently. A Badger and a bamboo balisong sold. Those were some expensive pieces. Luke Enas, Thanos74 and seandavid55 like this. Thanks to the bass_master, otherwise know as Brad, I was able to add to my collection this past week. Very happy with my new acquisition! Blue Premium AB infinity!!! Flips like a dream! BennytheBlade, Balibuyer and seandavid55 like this. 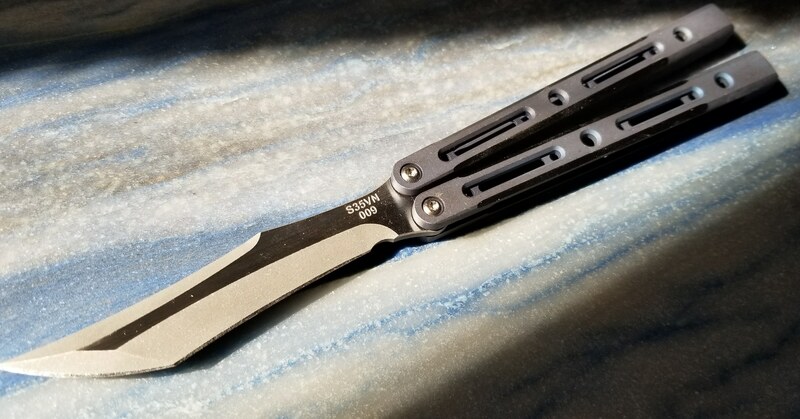 Courtesy EDCknives,I’m completing some remedial maintenance for my busted BM62. thegoodedge, Balibuyer, Thanos74 and 2 others like this. flatblackcapo, Mastema, seandavid55 and 2 others like this. Baliman987, thegoodedge, AnthonyTheAbyss and 2 others like this. tonyn1, Balibuyer, rockgolfer and 2 others like this. Ringed Gargoyle #19/20 With Chad Nichols Raindrop Damascus Blade And Full Blacked Out DLC Handles/Hardware.